NEW BEGINNINGS-IT TAKES COURAGE TO CHANGE ©: FIRST DAY IN THE POOL!! Greetings to you family of God in the Name of Jesus. I hope this finds you in good health and spirit. And Still Standing On Your Rock! Amen. I am writing another message to be posted, but to be honest...right now, I am just tired. Pooped is a better word. Well, for various reasons, in part because of the OPPRESSIVE HEAT!! Here in NC! Another reason is that I have been on 'mommy duty' by myself since June 4th until the 14th of June. And our girls are !excited!, they are still in "doing something every minute mode", and EXCITED!! that school is out. I am also tired of having to be in contact with people that are set on being negative, disobedient, callous, selfish, and unmoving in their little power and thoughts. Also, the way the heat affects my body and strength...i am drained. OK, so, since last friday the girls have gotten out of school at noon. Today is the absolute last day of school for them. I called a former student of mine who helps me out around here with yard and repair stuff. He is truely a gift from God. And the funny things is - is that his grandfather worked for my grandfather for many years at the school my grandfather founded nearby. So he came over last friday and we put up the above ground 18' by 4' deep pool. It took many hours to pump 6000 gals of water into it. It was over 100 degrees outside. As I am sure you know, It was worth every dime that I paid him to do the work. This post is to pay tribute to God for natural water, and His Living Water. To tell anyone that will listen, how He has supplied everything that we need in this family, so that we are able to have this pool for our girls. To have all the natural things that we do- But foremost for the spiritual gifts that must come first and have come first! amen. This post is to allow my spirit to rest for a few, to allow restoration to fully be received and to let my body, mind and spirit totally live in the flow of Mother God's Holy Spirit. To thank God that His Spirit reminds me to stop any negative thoughts and feelings that try and move in longer than a few mintues. To thank God that I have a wonderful family (godchild included) and that even though they can drain me at times--i would not let go of them for a second! This post is to remind me that I am grateful to God in the name of Jesus that He is teaching me how to serve Him first, and how to serve my family. Learning How to serve others is important when you are a Child of The Most High God. Did I mention that it is over 100 degrees outside!? It is so HOT sometimes i have to go check to see if the AC is still on! Whew! But I must thank God because with all these little nips and paper cuts, i am greatly humbled at God's peace within me and around me. We have nothing really to complain about here in this home. We have bills that will be due soon and right now, we have no idea how God is going to do it....But We do know this ...HE IS GOING TO DO IT! I HAVE NOTHING TO COMPLAIN ABOUT! Thank You Jesus,. I love all of you that visit here to this place of comfort and encouragement...God is good and He is Good All The Time! I am being given rest and a stronger peace even as I type this now. Thank You Lord, for I am willing. NO matter What state you are living in right now.....continue to say to yourself that You believe , and you may not know what and how God is going to do what you need in your life right now--JUST KNOW, THAT HE IS GOING TO DO WHAT YOU NEED - RIGHT WHEN YOU NEED IT! I am going to enjoy the laughter and joy that water gives to children. I am going to allow them to remind me of the joy I experienced when summer came and school was closed and all there was to do was ride my bike, go swimming, look at tv (no cable back then-but it was still good), read, draw, paint, and just do nothing........but be young and filled with wonder. I don't want to miss out on these little ones lives. They are growing up so fast. re-read any previous messages that you are led to and PLEASE Do Enjoy=En-Joy=IN JOY, this day- for it will never come back around again. Continue to hold on! Your Help is on the way! Be willing so that you will not miss it! as humans, i always feel like 'we have to believe in something...so why not believe in Him." it would make much more sense for everyone to believe in a higher power. as for the weather, yes, it's definitely too hot outside and being around negativity doesn't make it any better. i agree. 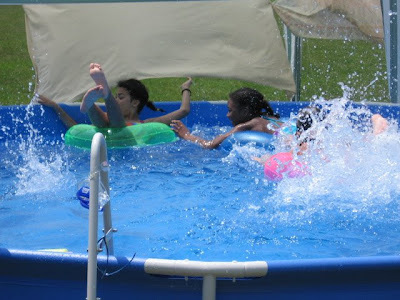 there is nothing like playing in the pool, as a child. i miss those days. At times like this I am reminded that I am not in my 20's anymore. lol co-sign. LOL. you are so right in your thinking. We all need to purposes ourselves to be tenacious with hope as hope fuels faith! so many people try to use faith without having any hope in God. God can change ANY situation and circumstance. But He Never changes! and that is the Beauty of Him-He Never Changes. 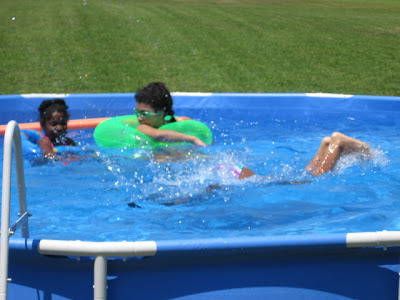 the kids are having a good time in the pool! the temps are to be a bit cooler for a few days-the humidity is lower! but it is still hot. And I keep pressing on as a prisoner of Hope for I KNOW God Will Do what He needs to do for us and for all that are waiting on Him. All who believe! Lovely pictures of the children, glad they are having a good time! 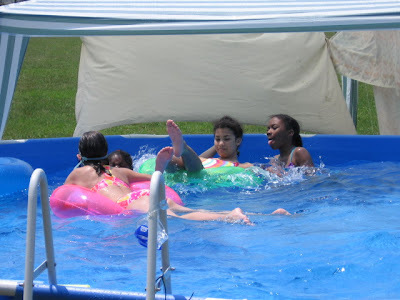 lolol, guurrlll they are having a ball! These pictures are fantastic and the children look like they are filled with joy!